I sat through a series of sessions held with legislators today in Utah, and I must say I was pretty impressed with the fiscal sanity that has ruled this state through the last 10 years, and saw it successfully through the recent downturn. When tax revenues were up last decade, they were doing crazy, nutty things like actually building up their rainy day fund. And they are already talking this year about contributing to rather than withdrawing from this fund. They still do silly politician-stuff (the law to name a state gun comes to mind) but overall a good session, facilitated by a terrific, scrappy group called the Utah Taxpayers Association. These guys had the governor, the Speaker of the House, the President of the Senate, and numerous legislators participating. I am not sure our larger and much better funded Goldwater Institute in AZ could do as well. As an added bonus, I found myself sitting with a talking to Billy Casper, two-time winner of the US Open and Master Champion. Turns out Mr. Casper is in roughly the same business I am, lending his name and time to a large firm that privately manages public golf courses. Bonus Utah Observation: You would expect a state with a large LDS influence to have oddities in its alcohol laws, but other than state-run liquor stores (which can be found in a number of other states, alas) I observed nothing too odd. What I had not thought about was coffee. There are very few Starbucks here, due in large part to LDS prohibitions on caffeine. I know a lot of software firms moved here -- I wonder how they even function without large supplies of Mountain Dew Code Red? Oh, and I know you don't think BBQ in Utah, but Pat's is freaking awesome. My competitor who is based on the area was nice enough to buy me lunch. And just in time, as about an hour later it was announced I had just won a large contract from him. I saw Randal O'Toole (known to bloggers at the "anti-planner") speak at the Goldwater Institute last night on transportation. 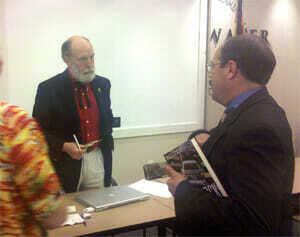 He is on a book tour for his new book "Gridlock" and he is really a fascinating speaker. Highly recommended if he should be speaking near you in the coming weeks. The really crappy cell phone picture below is of O'Toole on the left talking to Byron Schlomach of the Goldwater Institute. In only five years, the Arizona Health Care Cost Containment System budget is slated to more than double. When double-speak government agency names meet reality!